3.30pm | POLICE have sectioned off a turning lane at Rosedale Rd where a firetruck rolled onto its side earlier this afternoon. 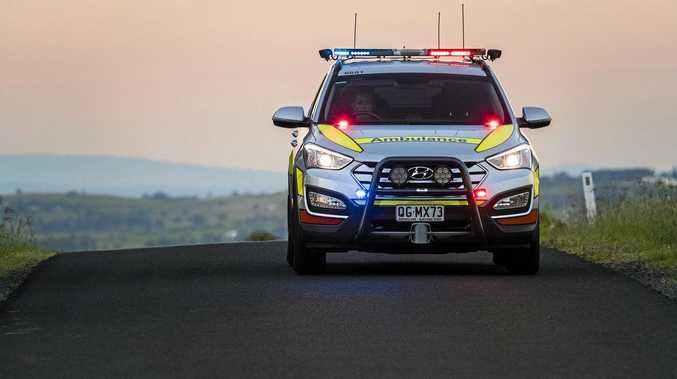 A second Queensland Fire and Emergency Services truck is waiting on the side of the road, as well as a number of emergency services crews, who will work together to right the wreck and remove it from the scene as soon as a responding tow truck arrives. The NewsMail can confirm the female patient who was in the passenger seat when the truck rolled as it turned onto Rosedale Rd has been released from hospital. She suffered only minor injuries to her left arm. A QFES spokesman said the driver also suffered minor injuries. "Our main concern is the welfare of the people in the accident," he told the NewsMail. Both occupants are rural fire service volunteers, however, they truck they were driving was a red pumper - which are typically used by urban firefighters. When asked why the two volunteers were in the red urban truck rather than a yellow pumper rural fireys typically drive, the spokesman said the vehicle was a tanker, which was shared across the region by both urban and rural fireys. He said QFES and Queensland Police Service would be investigating the circumstances surrounding the crash over the next few days. 2.20pm | A FIREFIGHTER has been taken to Bundaberg Hospital after the firetruck she was in rolled at Oakwood. About 12.40pm, Queensland Ambulance Service responded to reports of a single vehicle rollover at the SSS strawberry festival. The female patient in her 20s was reportedly in the passenger seat of the firetruck. It is understood the vehicle rolled while it was coming around a corner at the event, located at Rosedale Rd. She injured her left arm in the crash and was transported via ambulance to hospital. QAS left the scene about 1.10pm. A second fire crew attended the festival upon hearing of the rollover. A Queensland Fire and Emergency Services spokesman said that crew was still on scene. Earlier this morning, Queensland Police Service received a complaint of a person "zooming all over the road while towing a caravan" in the area, according to a spokeswoman.